VITAS Healthcare(r) is looking for people who love to sew and who are able to share their skills with hospice patients and families. 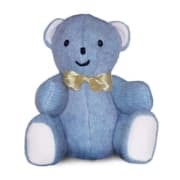 Sewn from a favorite pair of jeans, a pullover top, dress, bathrobe or nightgown, a Memory Bear may recall the closeness of a loved one, bring a smile to someone in distress, or offer a sense of security to a child who feels alone after the loss of a parent or sibling. VITAS will provide you with a free pattern for the bear.